Keith Ellison, the first Muslim ever elected to Congress, overcame serious obstacles Tuesday to win a historic victory as Minnesota’s first African-American statewide officeholder. “This 2018 election season is a season that allows us to make a definitive, clear statement that we are all in this thing together,” Ellison told a wildly cheering crowd of at a DFL rally in St. Paul, shortly after he won the race for attorney general late Tuesday. Democrats won all of six statewide offices Tuesday and flipped the state House majority by gaining 18 seats. Ellison, 55, came away with a fairly convincing victory as well, despite his status as the Democrats’ most besieged candidate. The outgoing Minnesota congressman, who also is vice chairman of the Democratic National Committee, withstood a fierce challenge by opponent Doug Wardlow. The Republican relentlessly portrayed Ellison as a political extremist, domestic abuser and defender of cop killers. For a time, the message appeared to resonate. As recently as Oct. 23, Wardlow polled 7 points ahead of Ellison, whose campaign was rocked by abuse allegations from ex-girlfriend Karen Monahan. Wardlow also made a strong showing during the campaign’s final televised debate on Oct. 21. A more recent KSTP/Survey USA poll had Ellison up by 4 points. Yet speaking to reporters an hour after he was declared the winner, Ellison was he was never certain of the outcome. 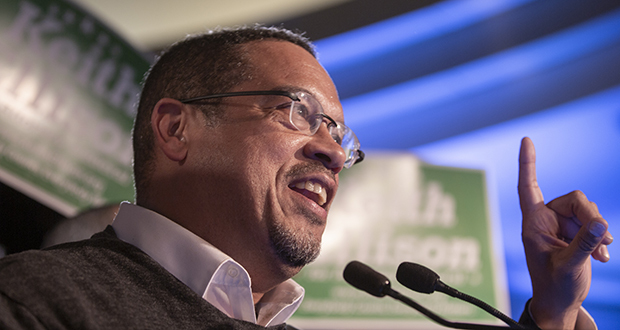 Pushing forward in the campaign’s waning days meant sticking close to Ellison’s metro base of strength. He held a series of Capitol press conferences in the final week that allowed him to feature constituents who stood by him. Those included metro area prosecutors, LGBTQ community advocates, progressive lawyers and legislators, and health care and gun-safety advocates. Ellison stood to answer sometimes barbed questions at almost all of those events. On Nov. 2, former state attorneys general Walter Mondale and Skip Humphrey backed Ellison at a Dorsey law firm event, warning against what they saw as the threat posed by Wardlow. Former Supreme Court Associate Justice Paul Anderson also made a surprise appearance in support of Ellison. Two days later, former Supreme Court justices Sam Hanson, Alan Page and Eric Magnuson — a GOP appointee — signed a paid DFL Party print advertisement in which they, too, backed Ellison. Anderson also signed it, as did several former chief deputy attorneys general. Wardlow, in the closing days, chose to lie low. When GOP legislators and police backers held Capitol press conferences during the campaign’s final week in support of the GOP candidate, Wardlow did not appear. He made few statements to the media and answered no questions about a late-campaign Pioneer Press piece accusing him of bullying, anti-gay behavior in his teens. The story meshed with Ellison’s portrayal of Wardlow as a religiously motivated anti-LGBTQ crusader. The campaigns traded bruising advertising barrages as the campaign reached a close. Wardlow continued to hammer on the Farrakhan connections and the cop-killer support and abuse allegations. Ellison fired back. He hammered on allegations that Wardlow anonymously authored a right-wing blog while serving as a state Supreme Court clerk, among other things. In the end, Ellison won out. “The spending at the last minute became critical in terms of getting a counter-narrative, a different message out about Keith Ellison,” Schultz said. Not all of that spending was by the campaigns. The DFL, for instance, assisted Ellison with TV spots in which Wardlow’s recorded voice was heard promising to support the Trump agenda and to fire 42 DFL attorneys from the AG’s office. Those remarks belied Wardlow’s public strategy of portraying himself as practically an apolitical candidate. Schier said Ellison’s fortunes likely were boosted by strong voter turnout and other Democrats’ success on the ballot. Democrat Tim Walz won a convincing victory against Republican Jeff Johnson to become governor-elect, while the two U.S. Senate candidates, Amy Klobuchar and Tina Smith, also easily beat their GOP rivals. “In other words, the Democratic Party pulled him through despite his difficulties,” Schier said. Barbara Headrick, a political science professor in Minnesota State University Moorhead’s Department of Economics, Law and Politics, said Ellison’s victory was no surprise to her. She thinks “negative partisanship” was a factor and likely allowed Ellison to hang onto Democratic voters who might otherwise have voted against him. In the end, she said, they apparently saw him as the less objectionable alternative and stuck with their party. She said the Wardlow recordings also likely hurt the GOP candidate. “Those basically solidified for voters who were wavering about Ellison that they couldn’t bring themselves to vote for Wardlow,” Headrick said. Ellison was asked Tuesday how he would approach those who voted for him despite doubts about his domestic abuse allegations. “Every single day I am going to get up and earn their trust,” Ellison said, adding that he doesn’t blame anyone who is troubled by the accusations. Unofficial returns as of 3:27 a.m. Wednesday showed Ellison leading Wardlow 49 percent to 45 percent, with almost 99 percent of precincts counted and 86 of 87 counties reporting. Pro-pot third-party candidate Noah M. Johnson reeled in nearly 6 percent despite throwing his support behind Ellison. Ellison’s victory preserves a generations-long DFL hold on the state attorney general’s office. Had he won, Wardlow would have been Minnesota’s first Republican attorney general since Democrat Warren Spannaus replaced GOP incumbent Doug Head in 1971. Like this article? Gain access to all of our great content with a month-to-month subscription. Start your subscription for as little as $32.